It’s difficult being a libertarian. In addition to all the other challenges (such as trying to convince people stealing doesn’t become okay simply because the government is the middleman), I get conflicted about government waste. You’re probably thinking I’m wandering off the libertarian reservation. After all, aren’t libertarians big opponents of boondoggles, government waste, and pork-barrel spending? Do we want government to efficiently lure people into dependency? Do we want government to efficiently socialize health care? Do we want government to efficiently cartelize the agriculture sector? I hope the answer to all these questions is “NO,” which is why I generally focus my work on structural changes to shrink the size and scope of government. But every so often, notwithstanding everything I just wrote, I can’t resist pointing out really absurd examples of wasteful spending. And today we have two jaw-dropping examples. We know that government bureaucracies like palatial buildings and that cost overruns are the rule rather than the exception. Well, one of the new bureaucracies created by the Dodd-Frank bailout bill is setting records for extravagance with its new headquarters. 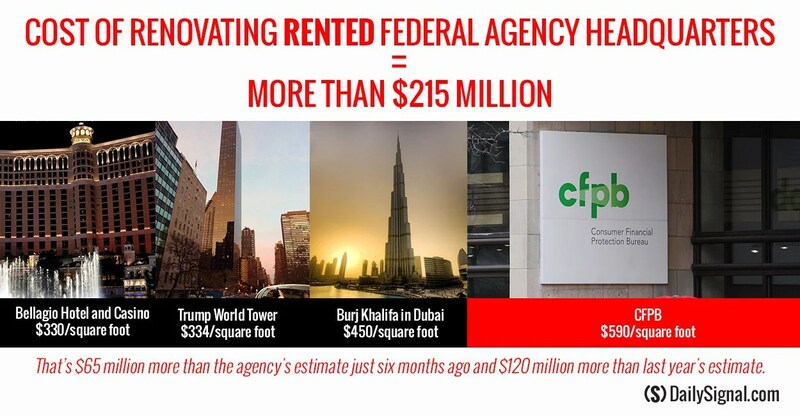 The newly created Consumer Financial Protection Bureau is renovating the Washington, D.C., headquarters it rents—at a cost per square foot that is more expensive than Trump World Tower in New York City. The CFPB project is estimated to cost taxpayers more than $215 million… Cost projections have increased $65 million in six months and $120 million since last year’s estimate. Some of the building’s extravagant features include a four-story glass staircase, two-story waterfall and a sunken garden. But what’s really amazing is that all this money is being spent on a rented building and that the cost of renovating is far greater than what was spent on building (yes, building, not just renovating) some of the world’s most famous landmark structures. Now for our second example. We’ve all heard about how big chunks of education spending get wasted on bureaucracy and don’t get used for classroom instruction. And we read about how welfare bureaucrats consume a lot of money that supposedly is targeted to help poor people. This principle also applies to other forms of government spending. CNN reports that the federal government’s program for emergency food aid around the world is such a cluster-you-know-what that barely a bit more than one-third of money is actually spent on food for crisis-stricken regions. International typhoons, hurricanes, and earthquakes leave behind devastating scenes of poverty and need. If you had about a $1.5 billion every year to send food to such desperate areas, how would you do it? …The way the U.S. provides international food aid is an antiquated and bureaucratic tangle. Food largely has to be purchased here in the U.S., and then shipped on boats by U.S. cargo carriers to the trouble spots. The Government Accountability Office says that 65% of the money for this aid program is spent on shipping and business costs – not on food. … it’s a system that has helped shipping companies and unions win billions in government contracts, companies like Maersk. …There’s also the transport workers unions. …The two leading maritime unions gave more than “three quarters of a million dollars to members of the current House of Representatives in the 2012 election cycle,” according to the Center for Public Integrity. Geesh, what a typical example of insider corruption. This is yet another piece of evidence for my view that disaster relief is not a function of the federal government. Dan, not only are you off the reservation but you seemed to have wandered into the cannabis patch, put down the pipe! Not only, as Ned points out, is the term an oxymoron it is also a statistical impossibility – there has never been one and never will be one on any level; people are, well, just people and they won’t stand for it . . .
this is all a symptom of the dismal failure of congressional oversight… these folks are just not doing a good job of protecting the interests of the American people… the post office… highways… the V.A… foreign policy… immigration… the a.c.a… [much of it contrary to constutional governance…] is all a pathetic mess… and our elected officials are doing nothing to correct matters… the solution is term limits… jail time… and asset forfeiture for corrupt politicians… if we let these weasels go… without holding them accountable……… a pox will be upon our nation… American life will be diminished… and out children will suffer untold hardships…………… all because we dropped the ball…………. This article ignores the quickest way toward “efficient government” (the ultimate oxymoron), which is to bypass the bureaucrats. Any form of flat tax would make tax collection more efficient, by eliminating bureaucrats in both public and private sectors. A shift away from means testing and toward a basic income (that could not be lost regardless of income earned) would eliminate nanny bureaucrats and get the federal government (not states or charities) out of the welfare business, while changing incentives for those escaping poverty. If a portion of that basic income were to be designated specifically for healthcare, individuals could purchase their own healthcare without the inefficiencies caused by the healthcare tax deduction, while eliminating government as middleman. Call it efficiency or the elimination of government as middleman, it’s a necessary first step toward the Mitchell Golden Rule. If you eliminate self sustaining bureaucrats and agencies, only then can you bring spending down relative to the size of the economy.